Lockheed Martin Corporation (LMT), a security and aerospace company, engages in the research, design, development, manufacture, integration, and sustainment of technology systems, products, and services worldwide. It operates through four segments: Aeronautics, Missiles and Fire Control, Rotary and Mission Systems, and Space Systems. The company raised its quarterly dividend by 9.90% to $2/share. This marked the 15th consecutive annual increase for this dividend achiever. Over the past decade, the company has managed to boost distributions at a rate of 18.40%/year. This was supported by growth in earnings per share from $7.29 in 2007 to $12.42 in 2016. Lockheed Martin is expected to earn $12.64/share in 2017. Currently, the stock is overvalued at 24.50 times forward earnings. The stock yields 2.60%. The company has benefitted from share buybacks over the past decade. 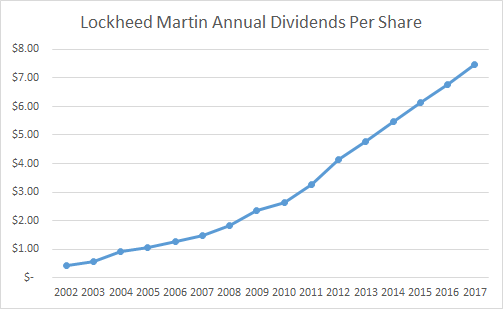 Lockheed Martin managed to reduce the number of shares outstanding from 416 million a decade ago to 291 million in the most recent quarter. Net income from continuing operations increased from $3 billion in 2007 to $3.753 in 2017. Earnings per share also received a large boost, because the valuations were very low a decade ago. Unfortunately, today shares are overvalued, but the company keeps buying them regardless of valuation. I believe that defense contractors are expensive at or above 20 times earnings. I would be interested in the stock when valuations are in the 15 – 16 times earnings range.